"Tricorn" redirects here. For the former building in Portsmouth, see Tricorn Centre. For the fractal, see tricorn (mathematics). "Three-cornered hat" redirects here. For the ballet by Manuel de Falla, see The Three-Cornered Hat. Tricorne of beaver fur, c. 1780, Europe or America. Los Angeles County Museum of Art, M.67.8.204. The tricorne or tricorn is a style of hat that was popular during the 18th century, falling out of style by 1800, though actually not called a "tricorne" until the mid-19th century. 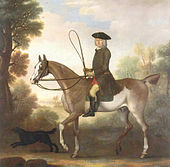 During the 18th century, hats of this general style were referred to as "cocked hats". At the peak of its popularity, the tricorne varied greatly in style and size, and was worn not only by the aristocracy, but also as common civilian dress, and as part of military and naval uniforms. Typically made from animal fiber, the more expensive being of beaver-hair felt and the less expensive of wool felt, the hat's most distinguishing characteristic was that three sides of the brim were turned up (cocked) and either pinned, laced, or buttoned in place to form a triangle around the crown. The style served two purposes: first, it allowed stylish gentlemen to show off the most current fashions of their wigs, and thus their social status; and secondly, the cocked hat, with its folded brim, was much smaller than other hats and therefore could be more easily tucked under an arm when going inside a building, where social etiquette dictated that a gentleman should remove his hat. Tricornes with laced sides could have the laces loosened and the sides dropped down to provide better protection from the weather, sun, and rain. Tricornes had a rather broad brim, pinned up on either side of the head and at the back, producing a triangular shape. The hat was typically worn with one point facing forward, though it was not at all unusual for soldiers, who would often rest a rifle or musket on their left shoulder, to wear the tricorne pointed above their left eyebrow to allow better clearance. The crown is low, unlike the steeple hats worn by the Puritans or the top hat of the 19th century. Tricornes ranged from the very simple and cheap to the extravagant, occasionally incorporating gold or silver lace trimming and feathers. In addition, military and naval versions usually bore a cockade or other national emblem at the front. This style of hat remains in use in a number of countries to the present day as an item of ceremonial dress. The tricorne appeared as a result of the evolution of the broad-brim round hat used by Spanish soldiers in Flanders during the 17th century. By pledging (binding) the brims, a triangular shape was obtained. This shape was favored by Spanish soldiers, as when standing at arms their muskets could be held at their shoulders right or left without hitting the hat brim. War broke out between France and Spain in 1667 over the Spanish Netherlands, and during the subsequent struggle its use spread to the French armies. The style was brought back to France, where its usage spread to the French population and the royal court of King Louis XIV, who made it fashionable throughout Europe, both as a civilian and military wear. By the end of the 17th century, the tricorne was popular in both civilian fashion and in military uniforms. They remained one of the predominant European styles of hat throughout the 18th century. In the United States, only the first five Presidents, from George Washington to James Monroe, wore this style of hat according to the fashion of the 18th century. James Monroe earned the nickname "The Last Cocked Hat" because of this. The tricorne quickly declined in use at the end of the 18th century. It evolved into the bicorne, which was widely used by military officers in Europe from the 1790s until World War I, not completely fading out of style until World War II. For enlisted soldiers, the tricorne was replaced by the shako at the turn of the 19th century, which had become the new dominant style of military headgear from 1800 on. Also at the turn of the 19th century, as the fashionable hat for civilian men, the tricorne was overtaken by the top hat. In 1917, the Women's Royal Naval Service introduced a smaller, modernised version of the tricorne for female officers. Tricornes survive today as part of the traditional dress of the Chelsea Pensioners (UK) and the Old Guard Fife and Drum Corps of the United States Army, and the distinctive hat of the Spanish Guardia Civil, called a tricornio in Spanish, originates from the tricorne. In the UK, a black feathered tricorne hat is part of the ceremonial dress of most Lord Mayors; at the annual Lord Mayor's Show in November, the newly elected Lord Mayor of the City of London can usually be seen enthusiastically waving his tricorne at the crowds. In the British Parliament until recently, both the Lord Chancellor and the Speaker of the House of Commons used to carry plain black tricornes as part of their formal dress each day when on duty; only on rare occasions was it worn (on top of the full bottomed wig): by the Lord Chancellor when acting as a Lord Commissioner of the Sovereign, and by the Speaker when rebuking a Member at the Bar of the House. In the United States, the tricorne is associated with the American Revolution and American Patriots of that era, especially Minutemen (militia members of the American Colonies). Participants in reenactment events often don tricornes, and they also can be seen in sports culture as worn by fans of teams with Revolutionary names, such as the New England Patriots (an American football team), the New England Revolution (a Major League Soccer team), the United States men's national soccer team, the University of Massachusetts Amherst, and the George Washington University. The Tea Party movement uses the tricorne as an icon to associate itself with the American Revolution. In France, synagogue officiants (usually not rabbis), wear the tricorne on formal occasions. In the French navy and air force, tricornes are still worn by women as a piece of uniform. The tricorne is a key feature in the University of Minho's academic dress, in Portugal. Its origins are as far as 18th century, as being the academic dress of Colégio de Estudos Superiores de S. Paulo, as depicted by tile panels in the Archbishop's Palace of Braga (now Rectorate of the University of Minho). Designated by "Tricórnio" (Portuguese for "tricorne"), this academic dress was redesigned and officially set 1989. In Canada, the tricorne is part of the ceremonial wear of the Speakers, both in the federal Parliament and in some provincial legislatures. It is also part of the ceremonial dress for justices of the Supreme Court of Canada. In 1981 the milliner John Boyd made the famous pink tricorne hat for Diana, Princess of Wales. This style became known as the "Lady Di" design and was copied worldwide. The British Speaker of the House of Commons carrying his tricorne, 1906. The Women's Royal Naval Service modernised version of the tricorne in 1942. Chelsea Pensioners raise their tricornes on Founder's Day. The town crier of Seaton in Devon, 2013. ^ "Gentlemen of Fortune". Gentlemenoffortune.com. Retrieved 20 October 2017. ^ "Digital Collection -Tricorn Hat". Memorialhall.mass.edu. Retrieved 20 October 2017. ^ "Cocked Hats". Williamsburgmarketplace.com. Retrieved 20 October 2017. ^ Digital History, Steven Mintz. "Digital History". Digitalhistory.uh.edu. Archived from the original on 23 July 2010. Retrieved 20 April 2010. ^ Real Life at the White House: 200 ... – Google Knihy. Books.google.cz. 2002. ISBN 9780415939515. Retrieved 20 April 2010. ^ Robert S. Summer. "James Monroe". Presidents of the United States. Retrieved 28 October 2014. ^ "Cocked Hat". Infoplease.com. Retrieved 20 October 2017. ^ Kannik, Prebben. Military Uniforms in Colour. Blandford Press. p. 268. ISBN 0-7137-0482-9. ^ Baclawski, Karen (1995). The Guide to Historic Costume. Drama Book Publishers. pp. 211–212. ISBN 978-0896762138. ^ Preston, Antony (1987). History of the Royal Navy in the 20th century. Presidio Pr. p. 71. ISBN 978-0891412830. ^ "Royal Hospital Chelsea". Chelsea-pensioners.co.uk. Retrieved 20 October 2017. ^ "About the Corps". Army.mil/fifeanddrum/about.com. Retrieved 20 October 2017. ^ "The Lord Mayor's Show". Lordmayorsshow.org. Retrieved 20 October 2017. ^ "Revolutionary War - Headgear". Revolutionarywararchives.org. Retrieved 20 October 2017. ^ "New England Patriots". New England Patriots. ^ "New England Revolution". Revolutionsoccer.net. Retrieved 20 October 2017. ^ "University of Massachusetts Official Athletic Site - Football". Umassathletics.cstv.com. Retrieved 20 October 2017. ^ Van Dyke, Nella (2014). Understanding the Tea Party Movement. New York: Routledge. p. 4. ISBN 978-1409465232. ^ "John Boyd". The FMD - FashionModelDirectory.com.